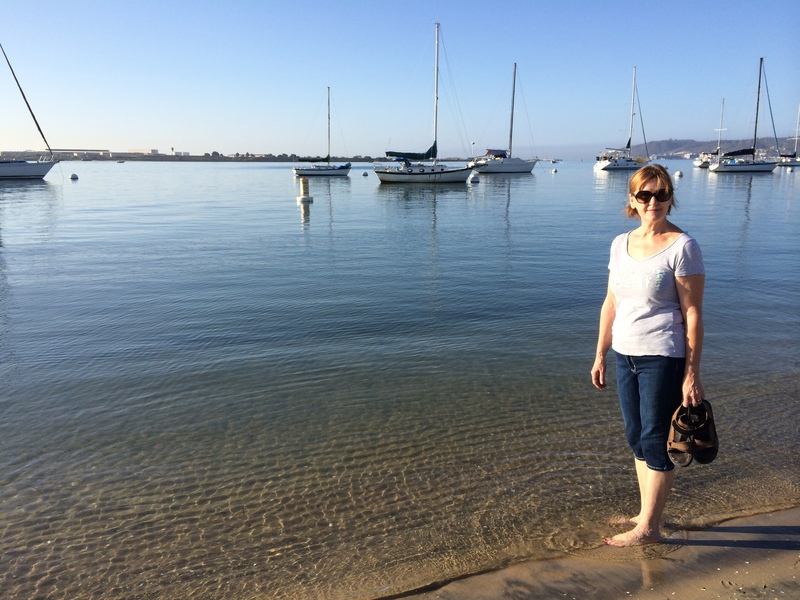 September 2014 – I continued my summer fun by heading out to teach in San Diego and Huntington Beach! Wendy Watson-Diedrick worked her little fingers to the bone arranging a fabulous line up of classes for me to teach as well as a talented group of people to study with. She also opened her home to me and drove me to Huntington Beach. Gracias! As you can see from the picture below, the San Diego crowd was a large one. Thank you to Terry Bajo for taking over the workshop duties, and to Victoria Kibildis for hostessing me at Wendy’s house, when Wendy had a family wedding conflict. A big thank you to Linda Mirth who orchestrated the Huntington Beach class…found the venue, rounded up the students, the housing and fixed a delightful lunch for Wendy and me at her home. Back to San Diego. What you can’t see is that we started on a Friday afternoon with a 10 person “Business of Calligraphy” seminar. Topics in the session ranged from copyright, to workshops and retreats, taking the orders, pricing and scheduling our day. We all grew by sharing our insight and expertise. 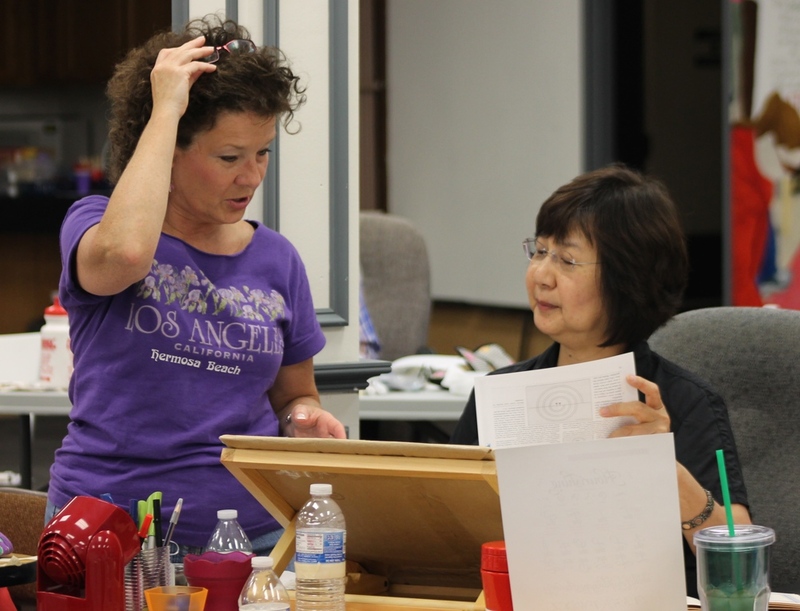 Friday evening, the guild hosted my “Calligraphy Today” digital presentation to a group of about 25. I walk you through my personal calligraphic background along with pictures of my studio, my father’s and mother’s work and later, I promote colleagues of mine, by showing select pieces of their work with different applications….lettering on glass, clay, tables, walls, violin, logos, greeting cards, books, etc. The lettering arts are still alive and well in this current day and age. 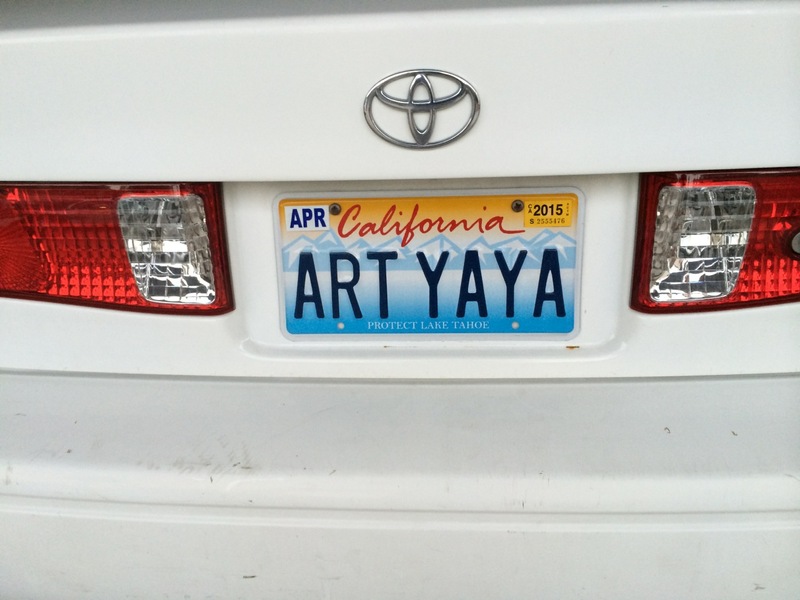 Nothing can replace the human artistic touch! Above, hostess Victoria introducing me to a San Diego beach! Glorious! 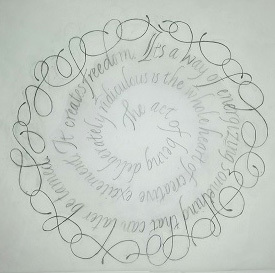 Below is her penciled spiral complete with interlocking flourishes. Great job Victoria….now to finish! 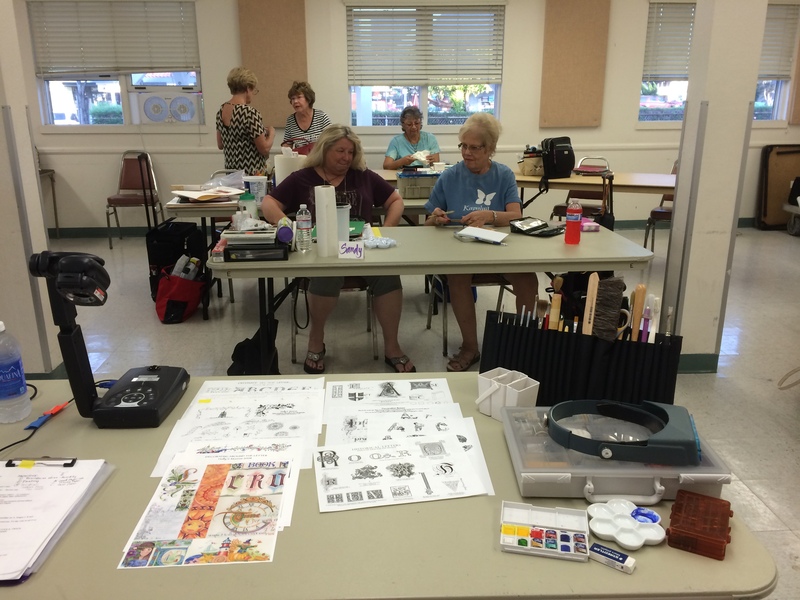 Monday, Wendy and I drove up the coast to Huntington Beach, where we met with Linda Mirth, who graciously orchestrated the evening Decorated Letters classes there. It was hot, hot, hot! Still there was a wonderful attendance of about 18 students, putting their hand to creating beautiful letters. 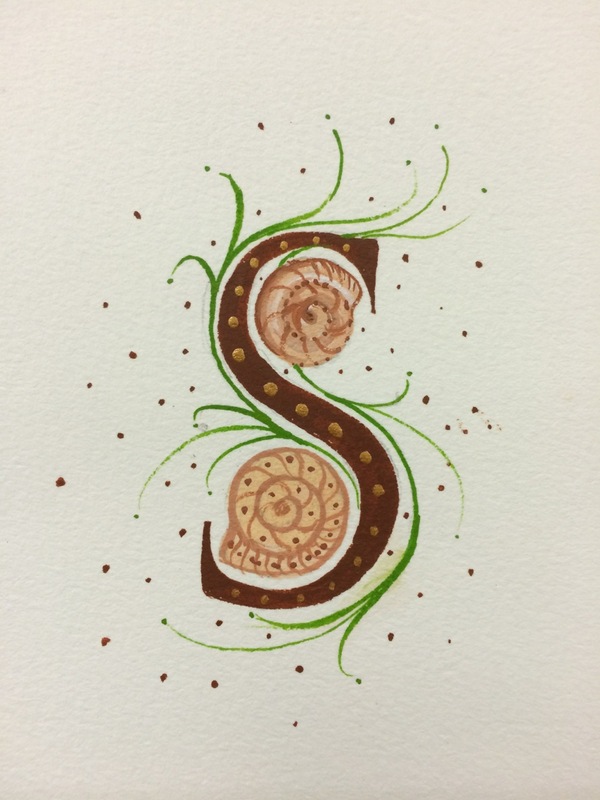 Here are a few…..first, Wendy’s decorated S with Seashells….. A very clever shoe makes the crossbar of a G, representing a family’s initial and interests…I need the name of the talented designer!! 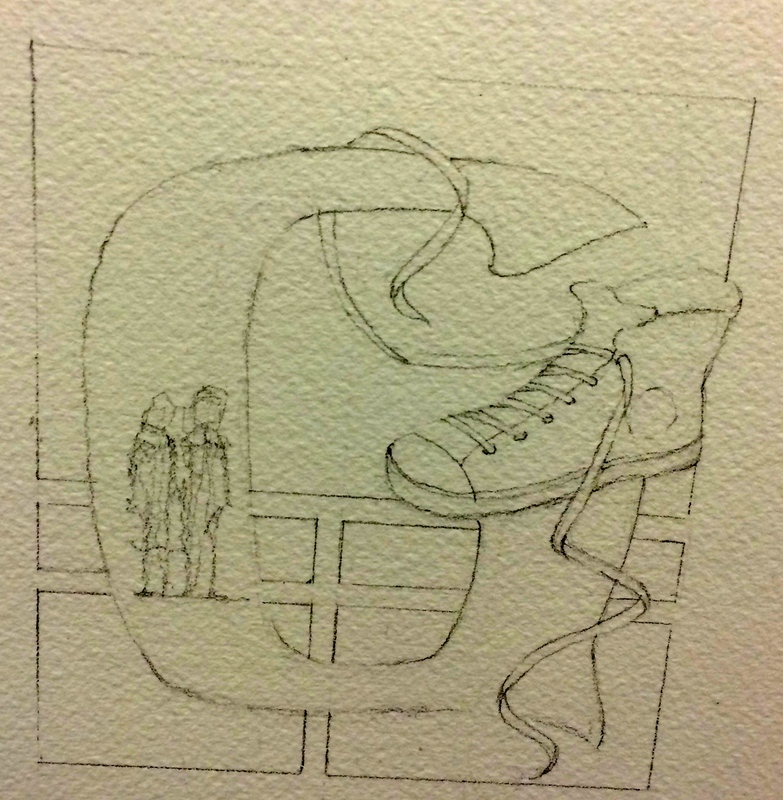 One of their exercises was to illustrate the letter. 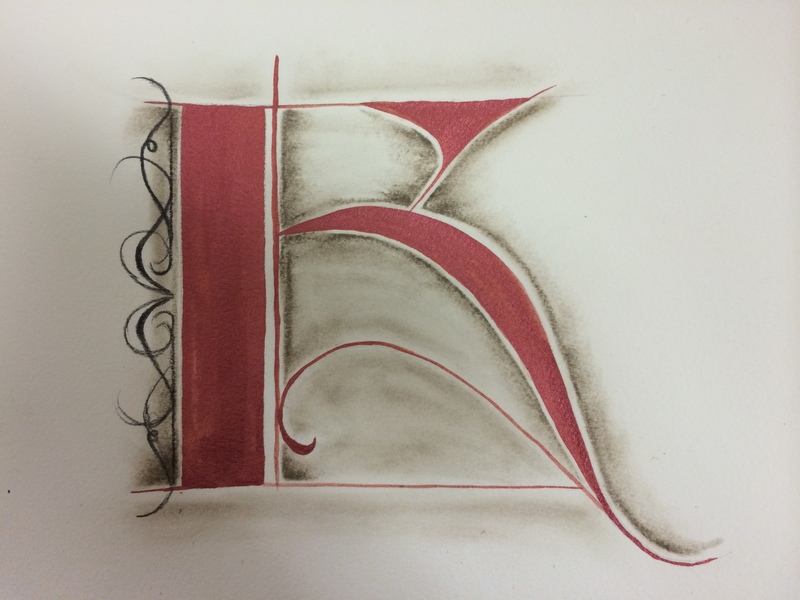 Nancy Kazanjian created this lovely “H” below….she is planning on adding another ‘musical’ layer to her creation. 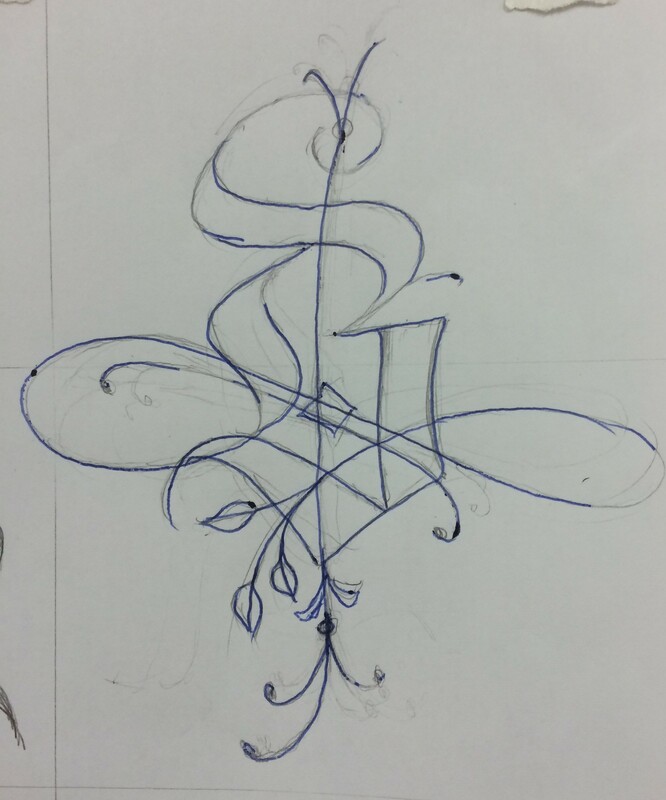 This exercise was exaggerating a part of the letter. 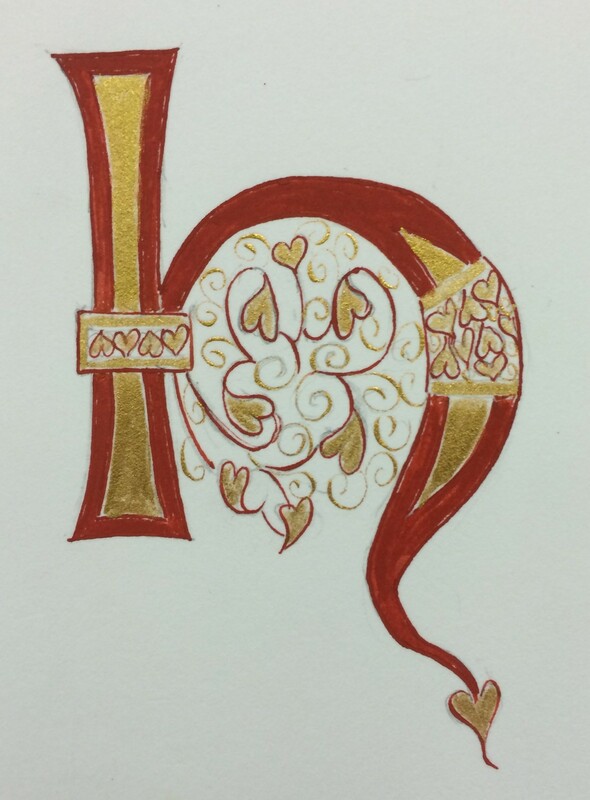 Below, Carole Johnson created this flourished “B” combining a more Fraktur looking B with flourishing…. 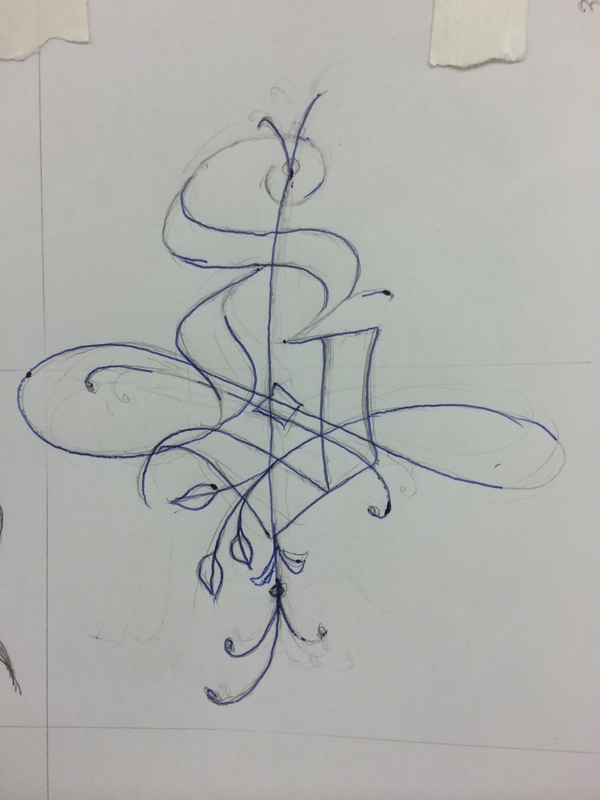 Stephanie Chao worked through the exercise of decorating “on” and “in” the letter. There were more, but these are a few of those who created the letters in about 5 hours or less. And below is Stephanie, Carolyn, Chris and Wendy smiling in the front. Here we were in Huntington Beach. 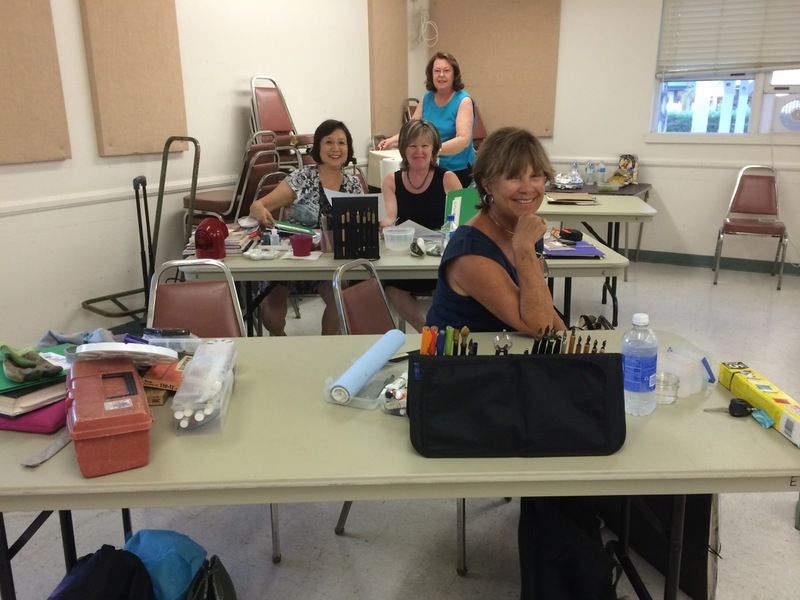 Thanks to all of them for a wonderful California calligraphy experience!